With one of the most impressive portfolios of online pokies in the industry, NetEnt games reign supreme for their outstanding graphics, cinematic grade animation, bonus games and innovative in-play features. NetEnt’s pokies collection spans into the hundreds and it’s impossible to pick favourites, but here is our top 10 NetEnt pokies list. Dracula received a lot of hype pending its release in early 2015 and it certainly did not disappoint. You only need to watch the harrowing intro of Dracula to know that NetEnt have really taken things to a new level with this game, using haunting animation to create a level of suspense unrivalled by any other slot game. The Dracula character sits alongside the reels at all times, keeping you on edge as he holds the power to activate the Bat Feature, turning himself into a herd of creepy bats that flock the screen to turn symbols into winners. It’s as impressive as it is eerie and is a must try pokies experience even for those who typically avoid spooky things. We just can’t go past Starburst for a simple, vibrant and effective online slot game. This is one of NetEnt’s classic and most popular titles and is often used as the draw card for players to sign up with a new casino, offering free spins on Starburst upon registration. There’s nothing particularly innovative or unique about Starburst, but that’s precisely why we like it, with bright reels filled with simple yet striking gem-like graphics that come to life upon landing a win. The popularity of this game is testament to the high quality work that NetEnt put into it and Starburst makes for an excellent mobile pokies choice when playing on your smartphone or tablet. Steam Tower is another 2015 release that made head waves with its innovative gameplay format. It utilises the popular steampunk theme, following a hipster looking gent as he attempts to climb further up the steam tower to save the shabby, sad princess from the nasty dragon. 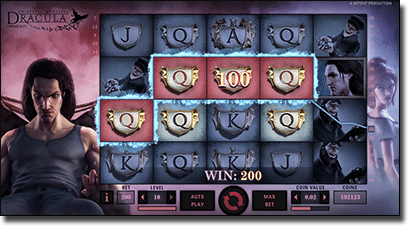 The draw card here is not just the great 3D graphics, but the unique role play format where you advance higher in the game every time free spins are triggered, moving up the tower and unlocking bigger wins. 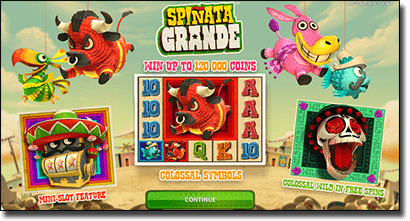 Colourful piñatas, kooky characters and all things Mexicana, what’s not to love about Spinata Grande? This game features a bunch of zany candy filled piñatas as they jump across the screen to a festive backdrop waiting to burst and reward you with their sweet insides. Mexican themed pokies have proven to be very popular (think Thunderkick’s Esqueleto Explosivo or BetSoft’s Paco and the Popping Peppers) and NetEnt’s stab at the theme has proven incredibly successful. We love the stacked and colossal symbols which allow the entire screen to be overtaken with the same symbol, with the chance to win the jackpot over all 40 lines at once. This beautifully animated pokies follows Gonzo, a Spanish Conquistador on his journey to find the Lost City of El Dorado, using an Aztec theme and impressive South American backdrop. One of the standout features of Gonzo’s Quest is the introduction of falling icons, where instead of symbols spinning on the reels they drop down into place which really adds to the gameplay. This also brings the new Avalanche feature, where winning symbols shatter and disappear to make way for new ones to drop down, a very cool introduction on NetEnt’s behalf. 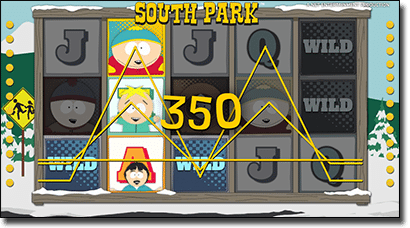 There are two NetEnt South Park pokies and while the second addition to the collection, South Park Reel Chaos is visually superior, the original makes our list due to the appearance of all the old classic characters including Mr Hanky, Timmy, Terrence and Phillip, Randy, Mr Garrison and of course Cartman, Kyle, Stan and Kenny. In this highly entertaining online slot game, all your favourite foul mouthed school kids show up in fine form across the reels, with sound effects and one-liners ripped directly from the show itself. If you love the original, the sequal South Park Reel Chaos follows a selection of the characters as they assume vigilante mode and take the form of DIY superheroes and is one of NetEnt’s most popular titles. Mega Fortune is the most popular progressive jackpot pokie on the NetEnt network and is the one to play if you’re looking for those truly colossal wins. Featuring icons of the high life like cash, jewels and fast cars, the symbols give you a taste of possible things to come, with Mega Fortune responsible for the biggest ever win in online casino history when a $22,974,400 jackpot was won by a Helsinki player in 2013. NetEnt partnered with 20th Century Fox to bring the famous 1986 film Aliens starring Sigourney Weaver into the pokies world and the result is an enthralling slot game that maintains all the suspense and sci-fi glory of the movie it came from. 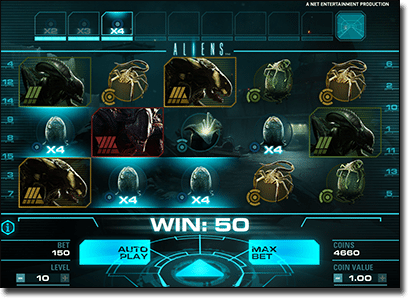 Not only is Aliens visually awesome, but it features three different levels to move up between in order to eventually destroy the Queen Hive, giving it more of a video game feel while offering huge chances to win. Like Starburst, Stickers is one of those good ole classic style slot games that we love due to the special NetEnt flair. It’s got that retro vibe mixed with high-def graphics and is one to whip out when you just want some simple but lively pokies entertainment. Stickers is a bright, joyous game featuring every colour of the rainbow in a cheerful fruit fiesta. Arabian Nights is another of NetEnt’s alluring progressive jackpot pokies, with the appeal coming mostly from the chance to strike it rich rather than any particularly enthralling features, but the game is still visually pleasing and a lot of fun to play. The Arabian Nights jackpot averages at $2 million dollars with a win approximately every 14 weeks, so need we say more? This list of incredible games is merely a starting point to the wonderful things that NetEnt is capable of. If you’re new to online pokies, we recommend you give these games a go to see just how impressive and entertaining virtual gambling can be.